Hay and straw have just enough similarities to confuse people who are new to their uses. Several substantial differences exist between hay and straw. You need to choose the right type of forage to use as bedding or you may find yourself wasting a significant amount of money when you purchase bedding for your animals. Hay is a type of forage commonly fed to horses, cattle and other livestock. Hay is grown primarily for its nutritional value, and it is cut before the plant can start producing seeds that would lower its nutritional benefit. Hay provides high-quality fiber as well as other nutrients that animals need to stay healthy. 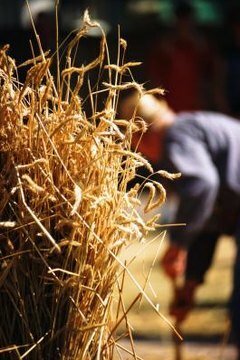 Straw is the stalk of the plant after the grain or seeds have been harvested. Straw is not grown for the sake of producing straw, it is the byproduct of other types of farming. Plants that produce straw have already put a significant amount of their available nutrients into the grain or seed they produce; straw is the leftover stalks of the plants after harvest. Straw provides low-quality forage. Straw is not as nutritionally valuable as hay and is generally less expensive than hay. Hay is harvested while it is still a live, healthy plant. Straw is the dead stalks of plants after the valuable parts of the plants have been harvested. Hay provides a good nutritional value for animals who are going to be eating it, while straw provides little nutrition. Straw is normally used for a bedding material, while hay is used as a feed supplement. Straw is dried out and works well for building nests and providing cushioning for animals to sleep in. It is not moist like hay and is unlikely to mold. Straw is also more practical to use as bedding than hay is, because of its lower cost.